Unlike most stone tools, stone knives have the same durability regardless of the type of stone used to make them. Stone Knives can only be crafted with a stick as the handle. Knapping out the Knife Blade. Metal Knives can only be made from tool metals. They can be cast in ceramic molds, or worked on a metal anvil. Bismuth Bronze, Black Bronze, Bronze, and Copper Knives can be cast using a Vessel or a Ceramic Mold instead of working on an anvil. Place an empty or partially filled Knife mold into the slot to fill it with metal from the vessel. It takes 100 units of metal to completely fill an empty Ceramic Mold. The text in the vessel's GUI will be updated to show the amount of metal remaining in the vessel. Put the ceramic Knife mold in the second input slot and wait for the filled mold to finished. Knife Blades can also be crafted by using ingots on an anvil with a hammer. This is the only option for higher tier metals that cannot be cast. The durability depends both on the metal used and the skill of the smith forging the tool. 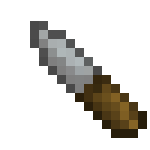 Knives can be utilized as a weak melee weapon inflicing piercing damage, though their best use is in a crafting table to remove decay, process cereal crops, cut food into smaller pieces, and scrape sheepskin and soaked hide. Knives are also used to collect straw from tall grass, to create a meal prep area, to shear sheep, and to open the leather working interface. Small sheepskin will give 1 wool, medium sheepskin will give 2 wool, and large sheepskin will give 3 wool. Raw Hide will drop as well. When a Soaked Hide is placed on a Leather Rack, a knife is used to scrape it and produce a Scraped Hide. Buffed Knife damage as a weapon. Weaker than an axe but better than fighting bare handed. Added getting straw by breaking tall grass with a knife. Reverse and double knife recipes added for knapping. Nerfed stone knife damage. Use javelins instead! Removed crafting of leather & knife to open leather working interface. If the output slot is shift-clicked while splitting food, it will result in each piece having a weight of half the one before it. For example: Splitting a 160 oz piece of food with shift-click will result in an 80 oz piece, a 40 oz piece, a 20 oz piece, a 10 oz piece, a 5 oz piece, etc. This page was last modified on 17 November 2014, at 01:23.